Happy Fall month of October! At EC San Francisco, we think it is very important for students to join activities to learn English in a fun environment, to use more English outside of school and to discover the Bay Area. Join us this month on some fun activities in San Francisco! Every month, the school plans a variety of activities for students with teachers, staff and student ambassadors. All accompanied activities in orange require a 5-student minimum, so it is very important to sign up. Most of the activities are free of charge, but some of them require a small contribution. Please pay for tickets and weekend trips at the front desk. Some of the highlights for this month include Alcatraz Tour, Kayaking in the Bay Area, Warrior’s Game Happy Hour, Halloween Party as well as so much more. Check out the October activity calendar to know all the activities for the next weeks! We have some great activities planned for you this month at this fun language school in San Francisco. We encourage students to join as many events as they can to increase exposure to English-speaking opportunities and environments! 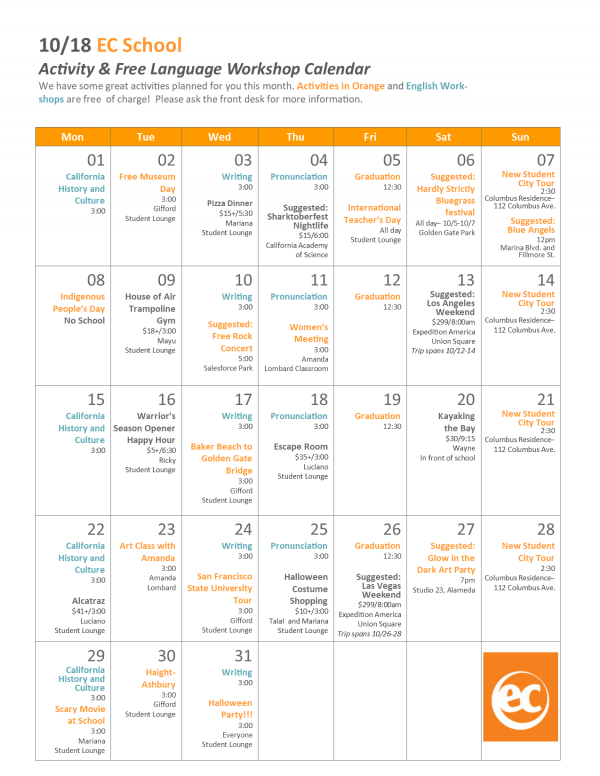 Classes in blue and activities in orange are free of charge. Please ask the front desk if you have any questions! Are you interested in studying in San Francisco? Check out English School in San Francisco!